???36???????  3 ???3?37??????34?3?3???35??????????3?????3???????? 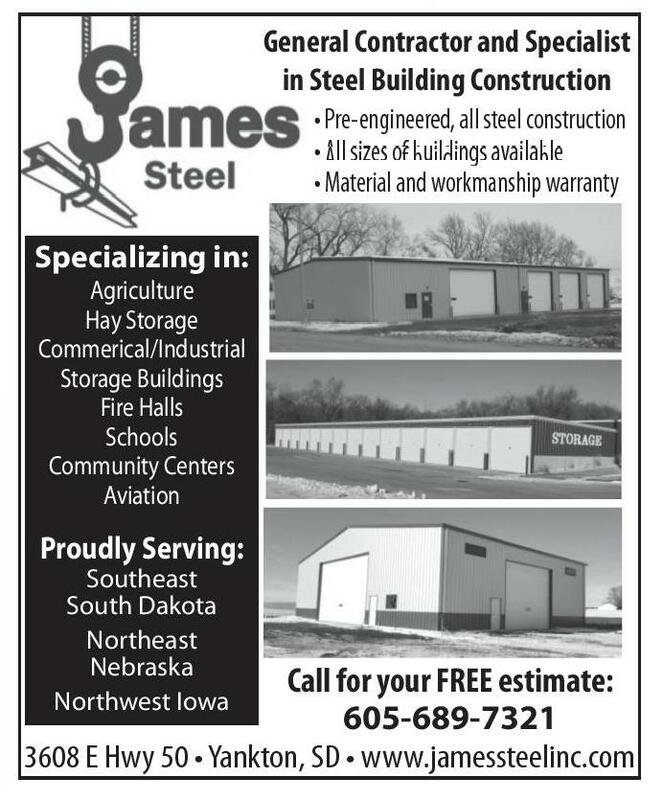 General Contractor and Specialist in Steel Building Construction • Pre-engineered, all steel construction • All sizes of buildings available • Material and workmanship warranty • Great Parts • Great Warranty 1007 Broadway Ave Yankton, SD ally contain a lot of fat, sugar and sodium and can cost up to twice as much more as making it at home. Fruits and vegetables that are already cut - they are usually a lot more expensive Junk food (candy, sodas, chips…) Also: Look at serving sizes of each package to determine how much food you will get from that item. Remember, prepared foods cost more than unprepared foods. Lettuce will cost less than bagged salad, just as a chunk of cheese will cost less than grated cheese. Buying fresh potatoes and preparing them yourself is usually cheaper than instant mashed potatoes. 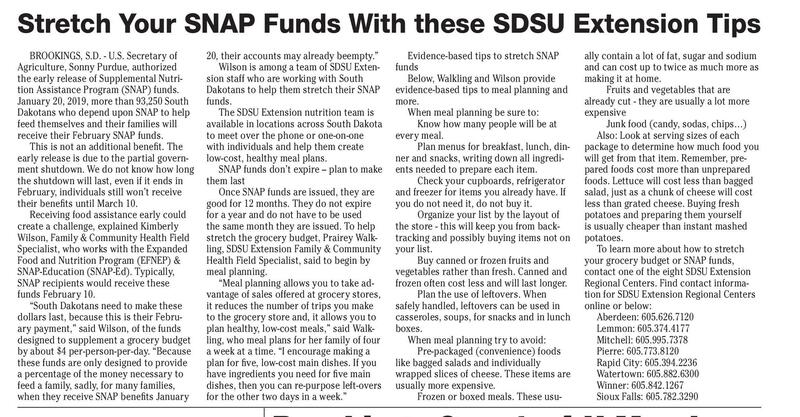 To learn more about how to stretch your grocery budget or SNAP funds, contact one of the eight SDSU Extension Regional Centers. 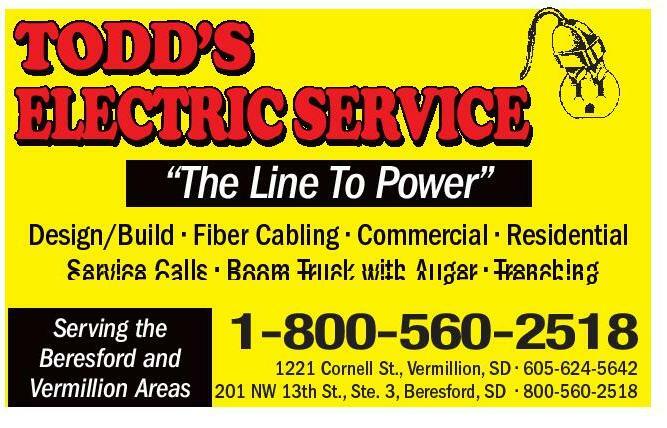 Find contact information for SDSU Extension Regional Centers online or below: Aberdeen: 605.626.7120 Lemmon: 605.374.4177 Mitchell: 605.995.7378 Pierre: 605.773.8120 Rapid City: 605.394.2236 Watertown: 605.882.6300 Winner: 605.842.1267 Sioux Falls: 605.782.3290 Brookings County 4-H Members Make & Donate 77 Blankets YOUR RADIATOR HEADQUARTERS! On-Hand & In-Stock! NO WAITING! Evidence-based tips to stretch SNAP funds Below, Walkling and Wilson provide evidence-based tips to meal planning and more. When meal planning be sure to: Know how many people will be at every meal. Plan menus for breakfast, lunch, dinner and snacks, writing down all ingredients needed to prepare each item. Check your cupboards, refrigerator and freezer for items you already have. If you do not need it, do not buy it. Organize your list by the layout of the store - this will keep you from backtracking and possibly buying items not on your list. Buy canned or frozen fruits and vegetables rather than fresh. Canned and frozen often cost less and will last longer. Plan the use of leftovers. When safely handled, leftovers can be used in casseroles, soups, for snacks and in lunch boxes. When meal planning try to avoid: Pre-packaged (convenience) foods like bagged salads and individually wrapped slices of cheese. These items are usually more expensive. Frozen or boxed meals. These usu- Athlete Spotlight Specializing in: Agriculture Hay Storage Commerical/Industrial Storage Buildings Fire Halls Schools Community Centers Aviation Proudly Serving: Southeast South Dakota Northeast Nebraska Northwest Iowa Call for your FREE estimate: 605-689-7321 3608 E Hwy 50 • Yankton, SD • www.jamessteelinc.com It’s a Triple Play! 9 3 JGP3[QW3DW[3C3ENCUUKHKGF3CF3KP3 V 3 JG3$TQCFECUVGT32TGUU3KV3CNUQ3 T 3 WPU3KP3VJG38GTOKNNKQP32NCKP36CNM3 C 3 PF3VJG3/KUUQWTK38CNNG[35JQRRGT3 H 3 QT3C3EQODKPGF3EKTEWNCVKQP3QH3  3 3CPF3WR3VQ33 R 3 QVGPVKCN3TGCFGTU Don’t Strike Out With Competitors, Get Your Ad in the Broadcaster Press Today! 201 W Cherry • Vermillion, SD • Phone: 624-4429 • www.BroadcasterOnline.com Rachel Brady Rachel Brady is one of the two seniors for the Vermillion girls’ basketball team. She averages 6.4 points, 5.4 rebounds, and 24 minutes per game. She is also a co-captain for the team. Rachel is not only a leader in basketball but is also a captain on the dance team and was in volleyball. She also participates in track. Rachel is the president of Student Council and Students Against Destructive Decisions (SADD), amongst participating in Show Choir, National Honors Society, and Peer Helpers. “There’s never been a time where I haven’t been in season, but in my rare free time, I enjoy hanging out with friends and spending time outside,” said Brady. She also enjoys helping at youth Bible study, running, drawing, and watching movies.